2015 Topps Series 1 Baseball Jumbo HTA Box. HTA Jumbo Configuration: 10 packs per box. 2015 Topps Baseball Series 1 is back with the biggest base set in a decade! With 350 base cards in Series 1, collectors can look forward to putting together a base set of 700 cards throughout the year. All the big hits from 2014 return, including Strata Signature Relics and the standard Hobby box exclusive clear parallel of the entire base set. 2015 Topps Baseball Series 1 will feature new inserts, autographs, and relics celebrating some of the greatest moments in Baseball history, as well as the biggest stars of today. And the 2015 Topps online program is sure to keep collectors coming back throughout the year and beyond! PRODUCT HIGHLIGHTS - 1 Autograph & 2 Relic Cards Per HTA Box! PRODUCT DESCRIPTION BASE CARDS (350) The biggest base set in a decade! 350 base cards, featuring Veterans, Rookies, Future Stars, League Leaders, 2014 Baseball and World Series Highlights, and Team cards. PARALLEL CARDS All 350 base cards will receive the following parallels: - Gold - Sequentially numbered to 2015. Snow Camo - Sequentially numbered to 99. Black - Sequentially numbered to 64. HOBBY & HOBBY JUMBO ONLY - Pink - Sequentially numbered to 50. Rainbow Foil Parallel - Inserted 1:10. Framed Parallel - Framed in silver, similar to Museum Collection Sequentially numbered. HOBBY & HOBBY JUMBO ONLY. Base Card Printing Plates - The four printing plates used for every base card, 1,400 total plates. HOBBY & HOBBY JUMBO ONLY INSERT CARDS & BUYBACKS - Inspirations 15 dual subject cards featuring a current player and a former fan-favorite from the same team. Gallery of Greats 25 of the greatest of all time on thick, paper-framed cards. Gallery of Greats Gold Parallel - Numbered to 99. HOBBY & HOBBY JUMBO ONLY - Free Agent 40 Free agency is 40 years old. These 15 cards take a look at some of the biggest signings in history. Archetypes Featuring 25 players from throughout the history of MLB who were the best at what they did. Highlight of the Year Throughout 2015, in Series 1, 2, and Update Series, the highlight of each year since 1925 will be featured. 30 will be found in Series 1. Baseball/History The history of baseball is intricately intertwined with history itself, and this insert brings that into focus. Thirty cards will pair a baseball highlight with a historical event that occurred on the same day. Each event will have its own card for 15 total pairs. Stamped Buybacks Vintage Topps cards stamped with a buyback logo. COMMEMORATIVE RELIC CARDS - HOBBY & HOBBY JUMBO ONLY - 1 per Hobby Jumbo box! MLB Silhouetted Batter Logo Pin - Featuring stunning metalized recreations of the MLB logo found on all jerseys! Future Stars Pin - Featuring the top ten Future Stars from 2015 Series 1 with a special pin created just for this set. Future Stars Pin Vintage Parallel - With a recreation of the 1987 Future Stars logo - Numbered to 99. Birth Year Coin and Stamp Cards - Cards featuring superstars from across the history of MLB and a coin and stamp from the year of their birth. Quarter with Stamp - Numbered. Quarter with Stamp and Autograph - Numbered to 10. Dime with Stamp - Numbered. Nickel with Stamp - Numbered. Penny with Stamp - Numbered. AUTOGRAPH RELIC CARDS - HOBBY & HOBBY JUMBO ONLY - Archetypes Autograph Relics - Numbered to 10. Highlight of the Year Autograph Relics - Numbered to 10. Inspirations Dual Autograph Relics - Two autographs and two relics per card! - Gallery of Greats Autograph Relics - Numbered to 5. Free Agent 40 Autograph Relics - Numbered to 10. World Series Champion Autograph Relics - Numbered to 50. Postseason Performance Autograph Relics - Numbered to 50. Strata Signature Relics - They're back! AUTOGRAPH CARDS - Career High Autographs Autograph cards recognizing the career high in stats of stars of yesterday, today, and tomorrow. Archetypes Autographs - Numbered to 25. Highlight of the Year Autographs - Numbered to 25. Inspirations Dual Autographs - Two autographs per card! - Gallery of Greats Autographs - Numbered to 10. HOBBY & HOBBY JUMBO ONLY - Baseball/History Cut Signatures - Featuring cut signatures from key participants in some of the most important events in history. Free Agent 40 Autographs - Numbered to 25. World SERIES Champion Autographs - Featuring members of the 2014 World Series ChampionsTM with an autograph. Postseason Performance Autographs - Featuring stars from the 2014 Postseason with an autograph. Strata Cut Signatures - Numbered 1/1. RELIC CARDS - Career High Relics - Relic cards recognizing the career high in stats of stars of yesterday, today, and tomorrow. Archetypes Relics - Numbered to 99. Highlight of the Year Relics - Numbered to 99. Inspirations Dual Relics - Numbered to 50. Gallery of Greats Relics - Numbered to 25. HOBBY & HOBBY JUMBO ONLY - Baseball/History Stamps - Each of these cards will have a stamp variation featuring a stamp from that year. Free Agent 40 Relics - Numbered to 50. World SERIES Champion Relics - Numbered to 100. Postseason Performance Relics - Numbered to 100. In the Name Relics - Featuring letters from the player's nameplate on the 2014 MLB All-Star Game Workout Jerseys. HOBBY & HOBBY JUMBO ONLY PROMOTIONAL PROGRAMS The Pennant Chase - A card will be created for each team. If the team on the card wins the pennant, it can be redeemed for a prize! Limited to 50 for each team. Online Code Card - With a code for use in this year's online program. 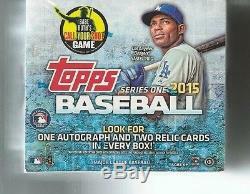 The item "2015 Topps Series 1 Baseball Factory Sealed HTA Jumbo Box In Stock" is in sale since Wednesday, February 04, 2015. This item is in the category "Sports Mem, Cards & Fan Shop\Cards\Baseball". The seller is "scsmkm" and is located in Dows, Iowa. This item can be shipped to United States, to Canada, to United Kingdom, DK, RO, SK, BG, CZ, FI, HU, LV, LT, MT, EE, to Australia, GR, PT, CY, SI, to Japan, to China, SE, KR, ID, to Taiwan, ZA, TH, to Belgium, to France, to Hong Kong, to Ireland, to Netherlands, PL, to Spain, to Italy, to Germany, to Austria, RU, IL, to Mexico, to New Zealand, PH, SG, to Switzerland, NO, SA, AE, QA, KW, BH, HR, MY, TR, BR, CL, CO, CR, DO, PA, TT, GT, SV, HN, JM.